Christian themed posters, whether pointing to Jesus, quoting Scripture, giving Bible verses of blessing, asking a spiritual question, or offering a welcome or invitation to church, can stand out in your community. Scripture art within a church, framed or unframed, can be inspirational. Publicity posters on the street can communicate encouragement and the message of Christ. 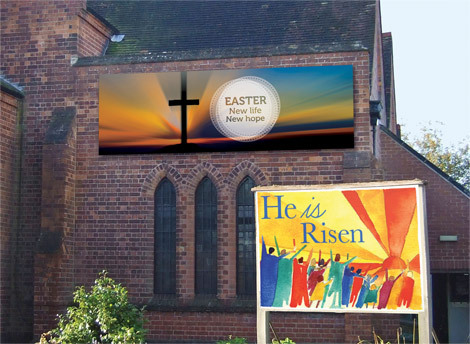 Whether for Christmas, Easter, youth, evangelism or events, whether customisable, vinyl, laminated or paper, there are ideas to browse here.